True treadmills are known for providing arguably the best home treadmill experience a user can have. With their exceptional belt and deck combination, no wonder they’ve been recepients of numerous positive reviews from respectable authorities. However, True Fitness (the company behind these treadmills) used to have a reputation of putting only average parts on their machines which resulted in lots of repairs and headaches for owners. But that problem is now a thing of the past with their new lineup that is definitely hard to beat. True Fitness Technology was founded in 1981 by Frank Trulaske. He has earned recognitions like the Ernst & Young Entrepreneur of the Year (1999) and The Fitness Industry Man of the Year (2000). And for over 20 years, he made True one of the few fitness companies that personally manufactures most of its critical components and systems. Today, True Fitness has over 240,000 square feet of manufacturing, engineering, testing, warehouse, and office space located at their corporate headquarters just outside of St. Louis, Missouri. They also have their own training and education facility to provide sales, product, and service training to their dealers and distributors worldwide. Is True The Best Treadmill Brand For You? If you want a machine with smooth operation and excellent cushioning, then this is the brand for you. But be ready to shed some cash. True treadmills are not for the budget conscious. If you don’t think you can afford at least $2,000 for a treadmill, then I suggest you visit our best buy treadmills page and look for a machine that fits your budget. As I’ve mentioned above, True treadmills come with premium price tags. Most of these treadmills range from $2,000 to $5,500 or more. And with prices like these, I don’t think the average consumer can afford it. Some of the cheaper True fitness products only comes with a short 30 year motor warranty. I know that 30 years is still a long time but if you consider most treadmills half their price are offering lifetime motor warranties, then this is definitely a weakness that True can improve upon. I would recommend True treadmills. They provide an excellent running experience with their famous orthopedic belt and deck combination that is probably the best in the business. If you’re going to buy True Treadmills, I suggest you get one from Amazon. But before you buy, please read our reviews on individual True products below. It will help you better choose the fitness equipment that suits you best. Others: True's Ortho belt for less than $2,200... Definitely a great bargain! Others: One of the cheaper treadmills from True but this one doesn't come with the orthopedic belt that True is known for. Others: The cheapest treadmill from the PS series that comes with an orthopedic belt. Others: This machine's biggest selling point is its adjustable cushioning which cheaper True machines above doesn't offer. Others: This huge machine is perfect for home or commercial use with its huge motor and numerous features, including an 11" LCD display. Below you will find some of the more famous True fitness equipment in the past that has since been discontinued. I will still keep these reviews here as some of these treadmills are still being sold on the internet either through auction sites or as refurbished treadmills. Others: this is the cheapest treadmill in the True lineup a few years ago. Others: this is the heart rate controlled counterpart of the True 400 P above. 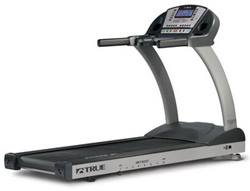 Others: this is the cheapest U.S. built True treadmill you can buy in the market during its introduction. Others: this used to be the best True treadmill in terms of providing value. Others: this is the non-programmable model of the new look 500 series. Others: this comes with pre-programmed workouts that the True 500 Non doesn’t have. Others: this is the ortho belt version of the true 500 P.
Others: this is the cheapest model in the 500 series that comes with heart rate functionalities. Others: this is the ortho belt version of the True 500 HRC above. Others: this treadmill comes with a wider running surface to give you more room to move and be comfortable during your workout. Others: this treadmill is identical to the True 540 P but with an ortho belt. Others: similar to others in the 540 series but with heart rate features. Others: other than the ortho belt and more expensive price tag, this machine is the same as the True 540 HRC. Others: this is the cheapest model in the extremely expensive 550 ZTX series. Others: this is exactly the same as the True 550 ZTX P but with an ortho belt and a more expensive price tag. Others: this one comes with heart rate features not available to both 550 ZTX models above. Others: this 550 ZTX machine comes with both heart rate and ortho belt features. Others: this was the top of the line True treadmill for home a few years back. And with a price tag of nearly $6,000, expect nothing but the best specs and features from this unit. Others: An innovative treadmill unit with lots of unique features. This machine is one of the best True treadmills in the market just a few years ago and one True machine that I recommend. Have You Ever Used a TrueTreadmill? If you have tried using a True, chances are visitors of this site would love to hear from you. It's fun, free and easy to do.